Several years ago, I served as a young, passionate associate pastor of The First Church of God in New Bethlehem, Pennsylvania. I had committed my life to Christ while I was a college student, around five years before starting at this church. As a Bethel Seminary student, and because I was personally driven to do so, during this time I immersed myself deeply in God’s Word, I would sometimes spend an hour in my Bible devotionally before going to the office. I listened to all types of preachers with various backgrounds and styles. I went to the Bethel campus in St. Paul, MN four weeks out of the year for intensives and then studied from home the rest of the year. I often had the opportunity to speak five or six times each week in various events, teaching settings, and breakfasts. People came to church three times a week. In Pennsylvania, students were offered what was called “release time,” meaning they could be taken out of school for religious education. The opportunities to teach God’s Word were plentiful. At the height of my immersion in biblical education and teaching, I had an experience that changed me. I was reading the Old Testament; Ezekiel 1. I found myself absolutely flustered with the meaning of the text. I got out my commentaries to understand the context. I got my Hebrew Bible and started trying to understand the original language. I read the passage from other translations. I read more slowly. I read faster. I tried to understand the book as a whole. I tried understanding it in segments. I searched online. I poured my heart into just trying to get a starting point to decipher the meaning of the text. I realized I was setting people up for failure. Something must be done. People need a system to understand the Bible and they need to understand the original meaning; I needed to be part of that solution. I began to ask questions like, “Why don’t we educate lay people better on how to study the Bible in context?” This is the most educated time in human history. We have all the resources at our fingertips. Are we, as leaders, afraid that people might actually learn what the Bible says? How messed up is that? Something else happened as I reflected on these questions. In thinking about a system for study, I counted the chapters of the New Testament. I couldn’t believe there were 260 chapters in the Protestant New Testament! Why is that such a big deal? Chapters and verses were added after the New Testament was written. They are merely reference points for us while studying scripture. I did some math. In our North American culture, most people adhere to a five-day work week or five-day school week. Multiplying 52 weeks in a year times five days a week, you get 260! This is the same number of chapters in the New Testament. So, the idea for The New Testament Challenge was born. It would be many years before it was completed, but the realization of that dream is in your hands. I believe God showed me the above numbers for a purpose. I believe he prepared me to write a book that comes alongside people as they read the New Testament. Obviously, this is only a starting point, because the Old Testament is equally important. Let’s start here. Let’s not only “read your Bible,” but allow me to shed some light on what you are reading through explanation, journaling guidance, key points, and prayer. I don’t believe I am a great writer, but I am a good writer. God called me to be a good writer to help people understand the best writer ever. God is the author of life. He is behind the inspiration of scripture and therefore the greatest writer of all! My role is to point you to Him and His living Word. It is hard to sit on the fence on doctrinal issues when you write something about every chapter in the New Testament. You have to address passages that are a problem to your own personal doctrine. You have to know something about every book in the New Testament. You are forced to think outside of denominational boundaries and risk losing those supporters. It is a risk to write a book like this, but the world needs it. Churches need it. 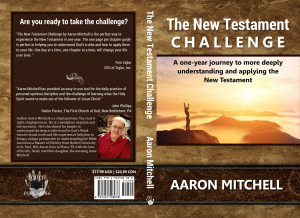 My prayer is that it will help each person who takes The New Testament Challenge. First, decide that you are going to take the challenge. Every year people declare their intent to “read through the Bible” and use various tools to do so. Some are overwhelmed before they even begin. We are reading through just the New Testament. It is manageable to digest and glean what God has to show you. Embarking on this goal with at least one other person will help keep you accountable. You will need three tools. A journal and something to write with. You begin by reading the assigned chapter for that day in your own Bible. The first day of the challenge, you will read John 1. I use the English Standard Version (ESV), but if NIV, NASB, NKJV or one of the other translations works best for you, then go for it. After you read the chapter in your Bible, turn to the corresponding day in this book. Read the entry. There are many, many lessons to be learned from any one scripture passage. I expand on what God impressed upon me to share with you. Following the entry is a personal journaling question. Answer the question in your journal or notebook. If the daily entry has guided any further thoughts, write those down, too. Following your journal time, there is a brief prayer for each day of the challenge. I know many of you pray more than one or two sentences a day. Use the prayer prompt as a starter in your conversation with God for that day. I always pray in Jesus’ mighty name. Each day also has a point to ponder and a key scripture passage from what you’ve read. If you embark on the challenge with a small group or partner, when you meet together you can share from what you read in the Bible, The New Testament Challenge entries, and your own personal journal. A group leader can choose to focus on one or several of the entries that were completed in the time between group meetings. Regardless of how it is done, you will actually have a group that is prepared to discuss and pray with each other. You will have all read the same thing, with devotional guidance, and insight into context and meaning. Some cautions: I know for a fact that if you are a deep thinking person who is reading this book to grow and for all the right reasons, you will probably not agree with everything I say in this book. That is good! What we are doing is inviting people into the discussion. It was a step of faith for me to write a book that came alongside every chapter of the New Testament knowing there may be critics. Some may read this book and think, “I wish I would have written this book, I could have done it better than this.” The Bible is God’s living Word. He will show you things relevant to your life that may differ from what is immediately presented. But, please don’t throw it out because we have different ideas about women in ministry, or I don’t align enough with your doctrines of Wesley, Luther, Calvin, or Arminius. The goal is to get people talking and understanding the Bible devotionally, while picking up insight about original context, meaning, audience, and author. If I am in error in an area of doctrine, then your group may need you. But, keep in mind they needed a tool like this book to get them started. I pray that you find this to be a wonderful journey and a worthy challenge. 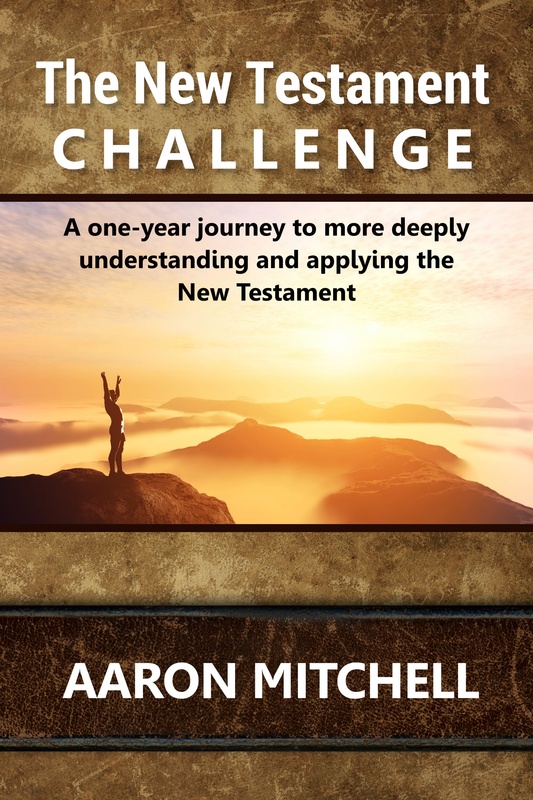 I look forward to hearing what The Challenge did for you, whether you are a professional theologian, well-studied layperson, new believer, seeker, atheist, or someone coming from a completely different perspective. With love I wrote this for God, then for you. Thank you for taking the challenge. Take it seriously. Hold each other accountable. Have a party or a banquet at the end of the year celebrating everyone who completed The Challenge and talk about what it did for you. Check out my new book. There are 260 Chapters in The New Testament. 1 Chapter a day 5 days a week 52 weeks a year 5 x 52 = 260! Take the Challenge! Change the World! Great word…he can actually write…very insightful and enlightening about the activities of the first century church. I recommend it highly if you are wanting to gain understanding of the work of Jesus and his Apostles.